What Does The Word "Arrondissement" Mean? For first-time visitors trying to get around Paris and certain other cities in France, the word "arrondissement" comes up time and again—but what does it mean, exactly? In Paris, it's inscribed on most street signs, preceded by a number (1 through 20): indicators that can be perplexing for anyone trying to get a grip on where they are and navigate more effectively. You've probably guessed that the term has something to do with city districts. The next step is learning how to put that information to use when finding your way around the French capital. Read on to learn what the term refers to—and to make your way around like a local. In French, arrondissement refers to a city district as defined by official zoning. Some major cities in France, including Paris, Lyon, and Marseille, are divided into several administrative districts, or arrondissements. 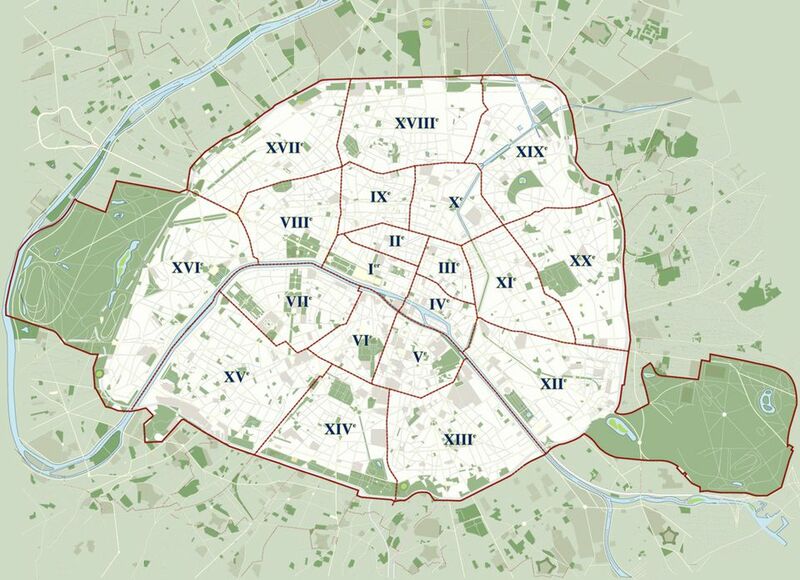 Paris has a total of 20 arrondissements, which start at the center of the city and spiral out counterclockwise. The 1st through fourth arrondissements make up the historic center of the city, while the 16th, 17th, 18th, 19th and 20th arrondissements are found at the western and eastern borders of the city. Also Known As: (In French): "quartier" (but note: some "quartiers" take up more than one "arrondissement", and vice-versa). Also, the concept of a "quartier" is far more arbitrary, while arrondissements are always clear-cut. How Can I Tell Which Arrondissement I'm In? In Paris, the arrondissement is marked in white lettering above the street name (usually placed on a plaque on the building closest to a street corner). Once you get used to locating these street plaques, you can easily figure out where you are. We highly recommend carrying around a good neighborhood-by-neighborhood map of Paris, or using a smartphone app, to make navigating the city as easy as possible. What Arrondissements to Focus on as a First-Time Visitor? There's no easy answer to that question: all 20 of the arrondissements have interesting things to see and do, and it will depend largely on your interests, available time and other personal preferences. However, if we had to recommend three districts that you should try not to miss seeing on your first exploration of the capital, it would have to be the four below. As you might expect, the 1st arrondissement is home to some of Paris' most popular and historically important sights, from the Louvre Museum and adjoining Tuileries Gardens to the Palais Royal, with its lush central gardens and unique boutiques. It's also one of the city's most-coveted shopping districts, harboring streets such as Rue St-Honoré and Place Vendome, lined with haute-couture and designer boutiques-- not to mention world-class hotels and hotel bars. Also enjoy gorgeous views from the Pont Neuf and other bridges looking out over the Seine River, connecting the right bank to the left. One of the most beautiful of Paris' 20 districts, the 4th arrondissement harbors its own share of essential attractions. Notre-Dame Cathedral is situated here on the Ile St-Louis, itself a picturesque "island" between the two banks of the Seine River and filled with winding, photogenic streets. Meanwhile, the historic and trendy Marais district combines medieval and Renaissance architecture with trendy fashion boutiques, terraces swarming with people even on weekdays, and some of the city's best street food. Next up is the 5th arrondissement, home to the legendary Latin Quarter and all its literary and artistic ghosts. Browse titles at the Shakespeare & Company bookshop or at the enormous French librairies surrounding Place Saint-Michel; have a drink near the old Sorbonne University; see breathtaking medieval art and objects of daily life at the Musée Cluny, and take a long stroll at the Jardin du Luxembourg (technically in the 6th arrondissement, but no matter). Last but certainly not least, most visitors will want to see the area that harbors the Eiffel Tower and the grand gardens that surround it, informally known as the Trocadero. The 7th arrondissement is grandiose, sprawling and prestigious, but it can be hard to know where to go once you've seen the tower itself. Read our full guide on what to see and do in the area for suggestions on restaurants, markets, walks, museums and more around the Eiffel. The 7th is also a favorite area for shopping: it's home, notably, to the elegant Belle Epoque department store, Le Bon Marché. Travel Hacks: What Stores and Shops Stay Open on Sundays in Paris? RER Trains in Paris: What Are They, & How to Take Them? Where to Connect to Free Wi-Fi in the 12th Arrondissement of Paris?